Successfully Added Cow MP3 Player - Small Moo to your Shopping Cart. Cow MP3 Player - does more than just look good. Inside of the unique outer design is a 2GB storage and powerful external speaker that makes for an unbullievable audio experience. 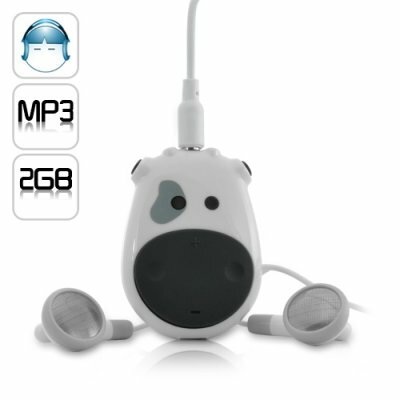 This adorable Cow MP3 Player is extremely easy to use and a great hit with everyone, especially the kids. The handy buttons (Volume up / volume down / next / previous / play / mute) get the music going quickly and the 2GB memory means you can listen until the cows come home. Also included is an external speaker along with a 3.5mm earphone slot, so you can listen alone or share with others. In case you’re on the hunt for a totally unique MP3 player, then his Cow MP3 Player has hit the bull's eye. The amazingly low price makes it a cash cow that simply can't be missed. Available in our warehouse now, order today and we'll ship it out tomorrow. Brought to you by the leader in China Electronics - Chinavasion. Bullieve it. Does this Cow MP3 Player come in any other color? At the moment, only the black/white one is available. If there is popular demand, we will provide other colors. Can I request other animal shape MP3 players? If you plan on making a bulk order (500 or more), we may be able to accommodate. Please contact our customer service team.